Saudi plans for "self-sufficient" nuclear power risk causing environmental risks, impacts and injustices that can potentially spread to its poorer neighbours and countries in the region. 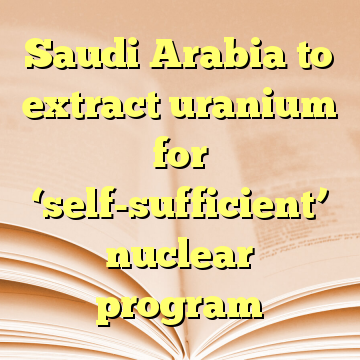 Saudi Arabia plans to explore and mine uranium in the Al Hail province. This is in the core of its ambition to achieve a self-sufficient nuclear programme. Saudi Arabia is hungry for energy to enable large-scale seawater desalination to meet its water needs, and to drive forward its industrial development. Possible environmental impacts of uranium extraction, increased desalination activities, and a fast-paced industrial development model are compounded by the repressive and opaque nature of the Saudi regime that will stifle consultation, accountability, and mitigation to ensure some level of environmental justice. Furthermore, through the power of its political influence and financial resources, environmental impacts risk spilling over or being exported to neighbouring states, further widening the scope of injustice. Atomic reactors need uranium enriched to around 5 percent purity, but the same technology in this process can also be used to enrich the heavy metal to higher, weapons-grade levels. Saudi Arabia would be the second country in the Arab Gulf region to tap nuclear sources after the UAE, which is set to start up its first, South Korean-built reactor in 2018. The UAE has committed not to enrich uranium itself and not to reprocess spent fuel. Industry sources have told Reuters Saudi Arabia is reaching out to potential vendors from South Korea, China, France, Russia, Japan and the US for its first two reactors..
Company Names or State Enterprises King Abdullah City for Atomic and Renewable Energy (KA-CARE) from Saudi Arabia - The Saudi state actor carrying out the uranium exploration and nuclear energy project. Saudi Geological Survey (SGS) from Saudi Arabia - The government entity surveying the uranium and thorium resources in Al Hail. China National Nuclear Corporation (CNNC) from China - CNNC is Saudi's partner in the uranium exploration project. Why? Explain briefly. There is no reported open opposition, whilere there are plans for Saudi Arabia to initially build two nuclear stations, and later build 16 civil nuclear stations over 20 to 25 years generating 16 gigawats of nuclear energy. 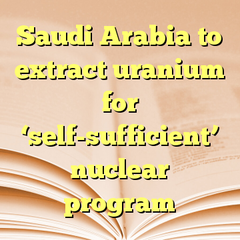 As reported in July 2018  : "Saudi Arabia’s first ever nuclear power project is gaining momentum with the Kingdom announcing that it had shortlisted the Russian State Atomic Energy Corporation (Rosatom) for the next stage of the bidding process. The King Abdullah City for Atomic and Renewable Energy (KACARE) has also shortlisted Korea Electric Power Corp (KEPCO) for the project. The United States, France and China are also among the contenders in the bid. The winner of the tender is expected to be chosen next year." Bloomberg, Why Oil-Rich Saudi Arabia Is Turning to Nuclear Power. Saudi Arabia shortlists Rosatom for its first nuclear project. 10 July 2018. Baset Asaba, Arabian Industry.